Today, on 28th of October 2014, the Czech Republic has birthday! 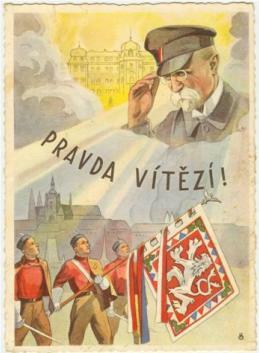 96 years ago was the indepency of new Czechoslovakia Republic declared in a Municipal House in Prague. As this is our national holiday normal people have day off but the Czech President’s agenda is full. This day he honors important people in Vladislav Hall in the Prague Castle and attends many ceremonies. And how our guides celebrate such an important moment? Well, we run our free walking tours as usual, with one little tiny difference – the guides wear piece of trikolora on their jackets. This year the President Miloš Zeman will award the Order of Tomas Garrigue Masaryk to Sir Winton who have saved 669 Czechoslovak children before the Second World War. After two decades Sir Winton will visit Prague and it is remarkable as he is 105 years old! The Order of Tomáš Garrigue Masaryk is highest state decoration established in 1990 and named in honor of Masaryk, the first Czech President. David, one of our guide, is big Czech patriot, so he decided to summarize the life and work of the first Czech president for you. If you like reading about strong characters and people who always stand for their opinions and ideas, then this article is just for you! Father of Czechoslovakia, the very first Czechoslovak president, philosopher and sociologist, humanist and democrat, the 2nd Greatest Czech according the national vote in 2005 (the winner was the founder of the university – king Charles IV.) – these things and much more we can mention while remembering the legendary professor Tomáš Garrique Masaryk. Masaryk spent long 17 years in his office, elected four times in a row, thanks to frequent changes of the Constitution and anyway, nobody could image anybody else as the head of the country instead of our father institutor. He abdicated at the age of 85. He appointed all together 14 governments. TGM was as the “President liberator” 17 times nominated to the Nobel Piece Prize, but he was never awarded. Tomas Garrigue Masaryk, the first Czechoslovak president. TGM was born on March 7th 1850 in Hodonín, South Moravia, close to the Slovak border as Tomáš Masárik. He was the oldest of three sons born to Slovak father and Czech mother with roots in Germany. At that time were the Czech lands part of the Austrian Empire. It was a time when Czech patriots started their so called “national revival” to defend their culture and language against the germanization. study: “Suicide – the massive phenomenom of the present time”. His femme fatale was an American – Charlotte Garrique. An incredible lady – sophisticated, beautiful, emancipated. They met in Leipzig, Germany, during Masaryk’scontinuing studies. They got married in 1878 and had later 5 children – Alice, Herbert, Jan, Eleanor and Olga. In 1882 Masaryk came to Prague to start teaching at the Charles University. He started to critise provincionalistic and nonscientic tendencies. Thus he stood against all during the cause of Zelená Hora and Králův Dvůr manuscripts and their origin. During the time of already mentioned National revival he disputed the originality of these manuscripts that dated back to the medieval ages, describing the very oldest Czech history. Why were they found suddenly in late 19th century? 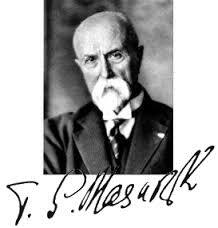 Yes, that was a logical question, but local patriots became very annoyed when Masaryk started this polemic. Anyway during 80s of the last century the scientific expertise proved, that the papers were younger than the alleged origin of these manuscrips, so they were really falsifications and Masaryk was right! Another cause when TGM stood against others, was so called Hilsneriade – Czech Jewish man – Leopold Hilsner – was sentenced for long time imprisonment, because he allegedly commited ritual murder of a Czech young lady. Justice, public – everybody influenced that time by the unhealthy patriotism and anti-semitism wanted the cruellest punishment, but Masaryk demanded fair justice, proofs and acceptation of the presumption of innocence. Although they never met each other, Masaryk supported Hilsner for a long time. As a rebel he was facing that time around 1900 lots of offence from the public. He was seriously thinking about emigration. This happened later under different circumstances. Masaryk understood that as an academic he was not that powerful to change the society, so he entered into politics. He was elected several times as a member of Austrian parliament, demanding the reformation of the centralized monarchy. Soon after beginning of the WWI he decided for emigration and an external resistance against the outdated monarchy. During his emigration in France and Russia he participated in founding of the Czechoslovakian Legions – the army made of the defectors who did not want to fight for the monarchy anymore. Czechoslovakian Legions, loyal to the allies, became the cornerstone of the Czechoslovakian sovereignty. and therefore on October 18th 1918 president Woodrow Wilson signed the Washington Declaration – a collaborative declaration of Czech and Slovak countrymen supporting the idea of the independent country. The Washington Declaration was in fact the establishing charter of Czechoslovakia. Czechoslovakia was internationally accepted after the resignation of Austro-Hungarian Empire in multilateral peace treaties. The Independence day came on October 28, TGM was elected president on November 14th and he arrived in his homeland in December, welcomed and celebrated by crowds around the whole country. What a great triumph!!! Masaryk’s ideas were summarized in “Talks to TGM” (Hovory s TGM) by the famous Czech writer Karel Čapek, great author and creator of the word “robot”. 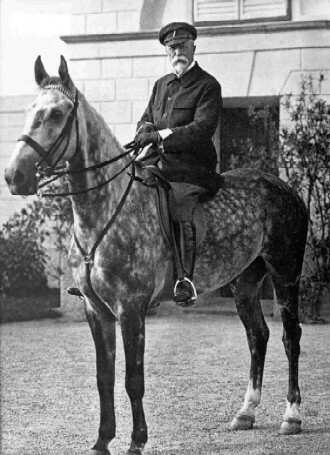 When Masaryk was 64 years old, he took up horseback riding because of his health. Thanks to hippoterapheutical riding, horses became to be his passion – the most known of his portraits are the photographs showing TGM as a rider – a proud leader of the nation. He passed away on September 14th 1937 in Lány, one year before the Munich Agreement. Lány is a town close to Prague with a chateau which has been the summer residence of the Czechoslovakian/ Czech presidents since times of Masaryk. At Lány cemetery you can find the tombstone of Masaryk family. TGM is a real icon respected throughout the generations and classes – lots of squares, streets or riverbanks around the whole country have his name. Second biggest Czech city Brno has the second oldest Czech university, called Masaryk’s, founded in 1919. Masaryk wanted to establish it before the WWI already. TGM is the face of the 5000 Czech crown banknote (the highest value). We can find Masaryk’s museum in his home town Hodonín. His life and work is studied by the Masaryk’s society. Around the whole Czech Republic are tens of Masaryk’s monuments – that one in Hodonín was destroyed three times during Nazi and communist regimes, but was rebuilt again and again!